When your alarm goes off, get up. It’s that simple. If you force yourself to throw back the sheets and get out of your warm and cosy environment, you’re one step closer to getting on with your day; pressing snooze three times can actually make you more sleepy as you fight with the need to arise, so instead of setting the alarm 15 minutes earlier than you need, just set it for the right time and get yourself out of bed. I can’t tell you how many mornings I waste scrolling through social media and reading news articles that really won’t enrich my life. My most productive mornings are when I simply leave my phone on my bedside table and don’t even look at it until I need to check how much time I’ve got left to do my hair. You’ll save precious moments, plus you’ll actually have something to look at on your commute. During the night our bodies become dehydrated; we need to rehydrate to ensure the effective flow of oxygen around the body, as well as the production of new blood cells. Seeing as our brain is also around 76% water, we need to lubricate it in order to feel awake and positive as you start your day. Drink at least a glass of water before you do anything else. It’s important to get our metabolism moving in the morning, as this sets the standard for the rest of the day. Make yourself a balanced breakfast that contains a high amount of protein and fibre, to fill you up and ensure you have the energy you need to get through your to-do list; eggs, porridge or even peanut butter on toast are great alternatives to those sugary cereals that will see you slump by 11am. 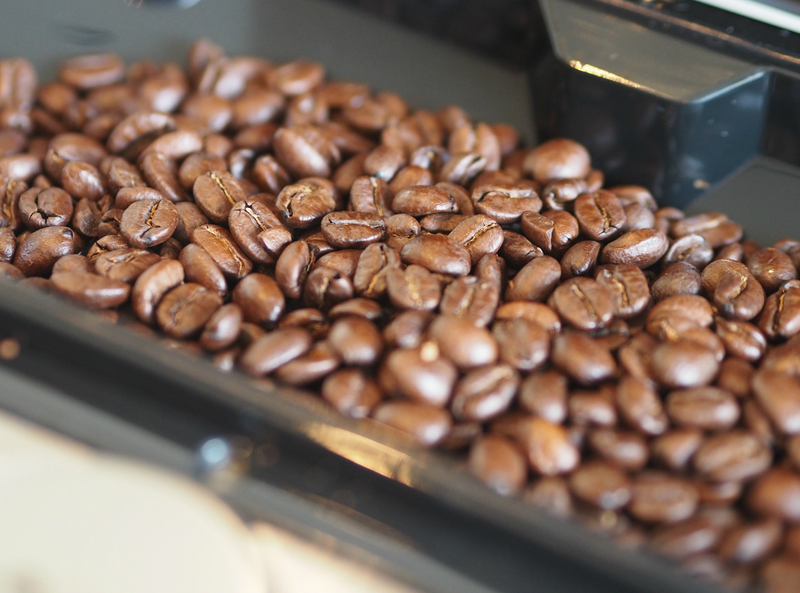 I’m such a coffee fiend that I actually worry what will happen if the world’s supply were to suddenly run out. 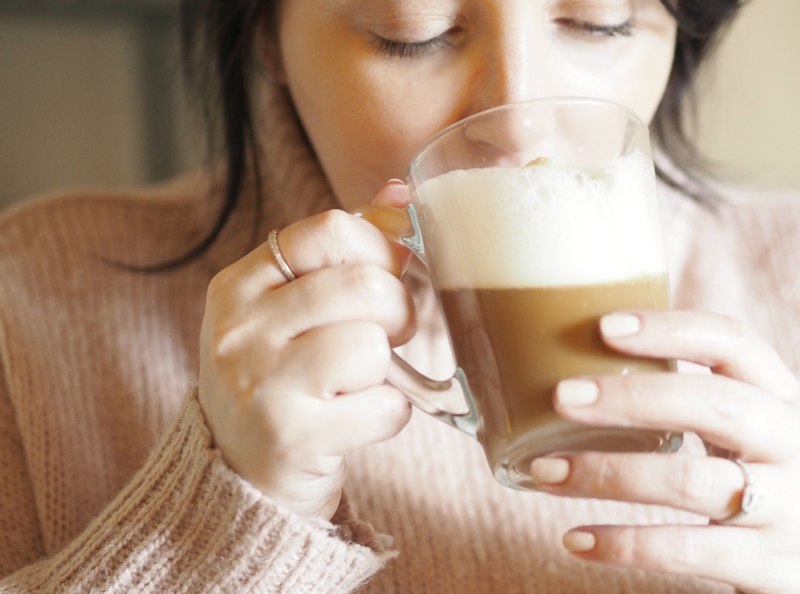 It’s the first proper task I usually undertake in a morning and I take great pleasure when sipping that first taste; it’s a comfort and a joy, plus a psychological kick-start to my day. I just don’t feel ready without at least one cup and really do notice if I haven’t had my coffee fix by 10am. 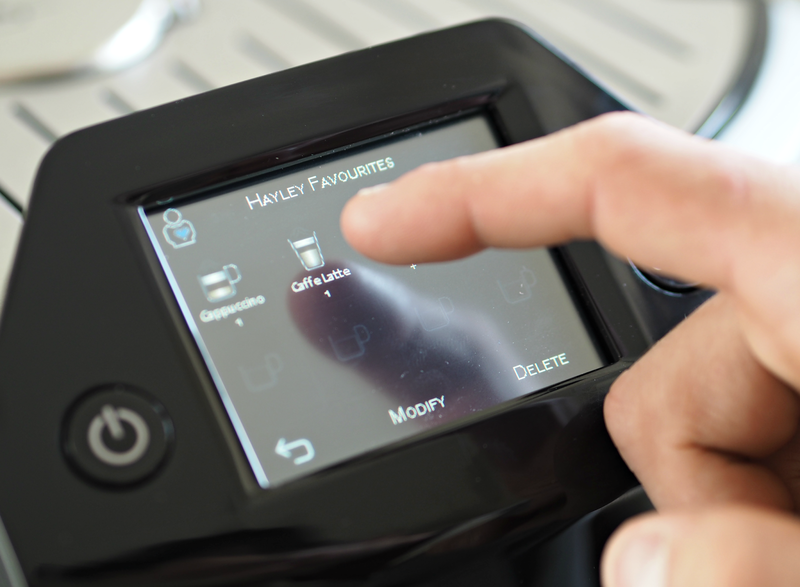 Having a coffee machine in my kitchen makes the whole experience even more enjoyable, knowing I can have a barista-style coffee at the click of a button. 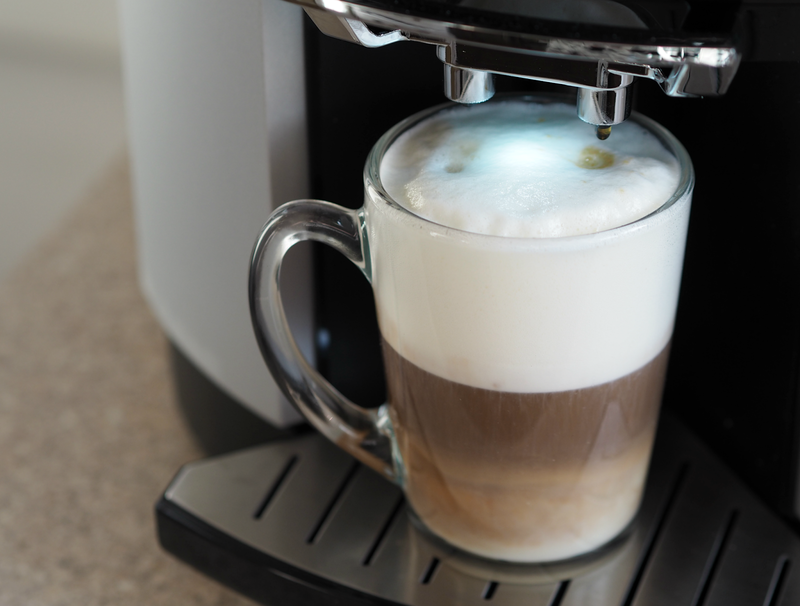 My ‘Bean To Cup’ is a morning wonder, as I know my double strength soy latte will be waiting for me within a few moments, without having to even leave the house. Is this what dreams are made of? 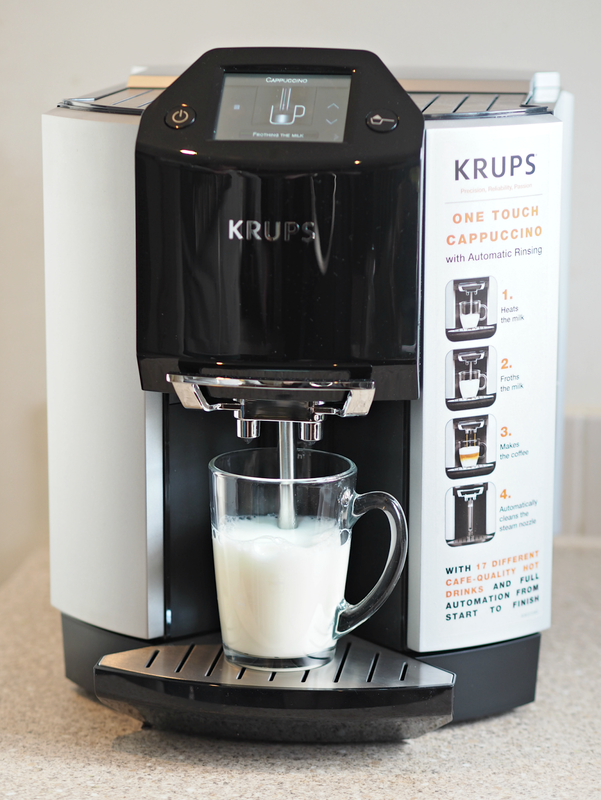 The Krups Bean To Cup EA9010 coffee machine allows you to make 17 hot drinks at the touch of a button (including Espressos, Doppios, Lattés, Cappuccinos and my current favourite, Flat Whites,) as well as offering the option to create up to eight profiles that can store your favourite coffee recipes for ease of use. That includes the style, size, strength and even temperature of your morning coffee! 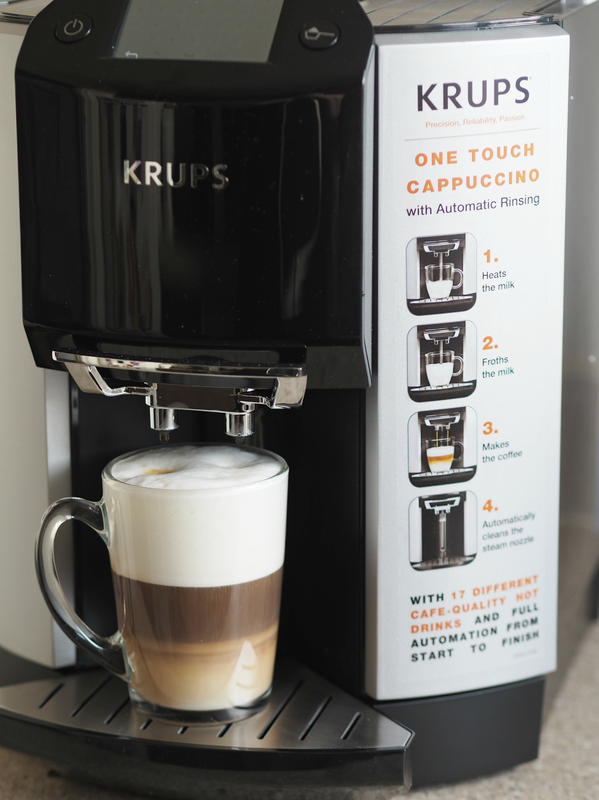 With automatic rinsing of the steam nozzle within the unit for increased hygiene and cleanliness, as well as no pods or liquid compartments so wastage is minimised, this may possibly be just as good as having your local barista live in your kitchen. I love the fact the milk is frothed within the cup automatically, rather than having to pretend I’m an Italian coffee connoisseur and remember my coffee making training from many moons ago. It’s compact and super sleek, as well as being an utter pleasure to use even when I’m in a rush. Although expensive at around £999.00, it’s an investment that will provide a morning moment of joy for years to come – and possibly a saving if you stopped buying those morning Starbucks! This is a sponsored post on behalf of Krups; all opinions are my own. Next Post How Do You Create A Skincare Regime In Your 20s? Glugging a giant glass of water is so refreshing first thing isn't it! Exactly. I'd rather spend money on this than a year's worth of before-work coffees from Starbucks. No one's telling you to blow a month's wages on a whim, but like most things people want and are willing to spend more on… if you want it, you save and treat yourself. I'm sure Ms Anonymous spends money on stuff I would baulk at, but everyone's different.